Just one hour of football this lunch time is standing in the way of Rice College, Westport from taking a spot in the biggest schools football game of all - the Hogan Cup final in Croke Park on Saturday, April 7. 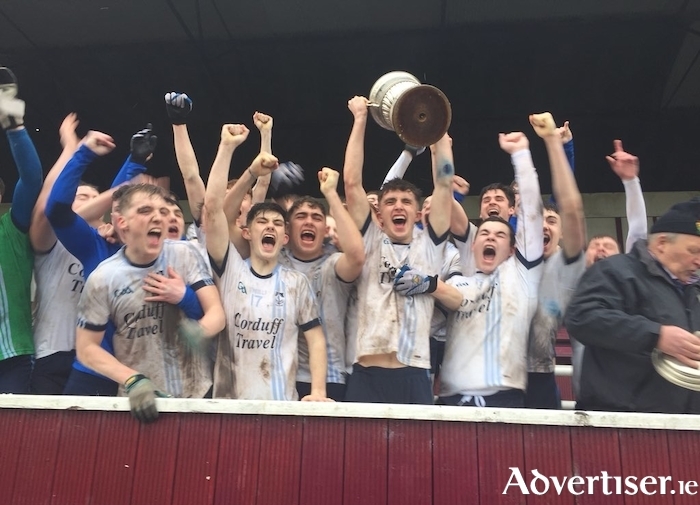 The Westport school claimed their first ever Connacht Post Primary Schools A title a fortnight ago with a very impressive dismantling of St Attracta's Community School from Tubbercurry. Today's game in Padraig Pearses in Roscommon is the meeting of two sides who have both just claimed their maiden provincial A titles with Naas CBS the men looking to crush the Westport outfit's dreams. Winning that provincial title has been the culmination of a long number of years work in the school with the management team of Martin Connolly and Shane Conway putting in a lot of work to bring the school to this point. In their Connacht final victory, Rice College were deserving six-point winners in Tuam Stadium, where they showed brilliant heart and tactical ability to overcome the loss of key midfielder Fintan McManamon to a harsh red card early doors. They were led superbly in attack that day by Keith Joyce who bagged 1-3 of their 1-13 total, while five of their starting six forwards all got on the scoresheet. Both captain Pat Lambert and corner forward Stephen Loftus chipped in with three points each, while Mark Moran and Luke Tunney notched over a point each and powerful midfielder Patrick Chambers had two well taken points in that victory. At the back, the Rice College defence will be well marshalled by the central pairing of Rory Brickenden and Eoghan McLaughlin, with the likes of Luke Dawson, Ray Walsh, Michael Brady, and Jack Carney needing to put in teak tough performances in their positions. Having seen the Westport intermediate team claim and All Ireland club title last Spring in Croke Park, these young Westport men will know they are more than capable of following suit, and a big following from Westport, Burrishoole and Kilmeena is sure to follow them to Roscommon today. In their way are a Kildare outfit who themselves had to survive going down to 14 men in their provincial final victory after Shane Allen was shown a second yellow card late on in a tight battle the edged 0-9 to 0-7. Their full forward Darragh Kerwin was their main scoring threat hitting 0-3 of their total with corner forward Colm Joyce chipping in with two points - which will give the Rice College defence a good warning of what they are up against this afternoon.